The image of the Hermit crowds the frame, consuming the space of his world. Gazing into the light of the lamp which he holds in his right hand, his face is gentle and contempletive. His eyes, perhaps slitted against the light, reveal little of his thoughts. In his left hand, he lightly holds a twisted and knotted staff, suggesting, perhaps, the twists and turns on the path to knowledge. The Hermit's finely woven cloak is fastened, not with the scarab of Egyptian mysticism, but with the Lady Bug - will she fly away home? 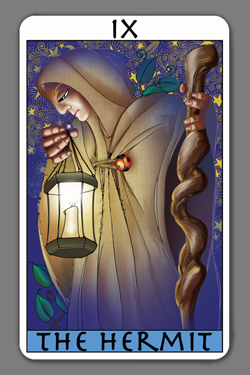 Behind and above the Hermit, the stars swirl and shoot in the deep azure sky, reminding us that deep knowlege may be rooted in the Universe, rather than in ephemeral introspection. The lamp, which hangs from twisted cords gathered in at a glowing blue jewel, gleams fiercely with a blinding glow. From the lamp, smoke wafts, curling and twisting in the still, calm air, echoing the twists and turns of the staff. And yet, it is not the lamp itself that holds our attention. Rather, it is the face and gaze of the Hermit - seeker after the light - that is the center of our attention. Click on the Image above to see a larger version.